Marla Olmstead is a little girl who has taken the art world by storm; she has been hailed as a Picasso-type prodigy and also compared to Jackson Pollock. Her paintings have sold for tens of thousands of dollars. 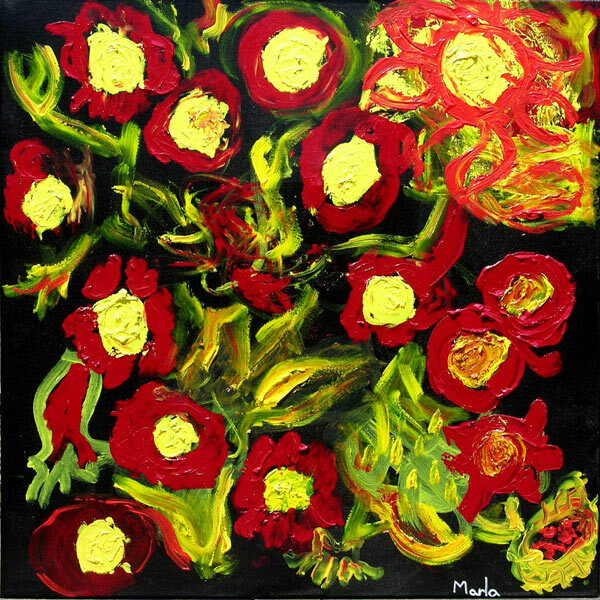 Marla began her painting career just before her 2nd birthday; she is now 6 years old. When she was featured on 60 Minutes however, questions were raised about whether she actually did all the painting. A child psychologist, Ellen Winner, who has studied gifted children and specializes in visual arts studied the paintings and videos of Marla painting, has grave reservations about whether Marla is the artistic force behind the paintings. According to Winner, videos of Marla show an young girl painting in the manner of ordinary young children, essentially pushing the paint around, playing and experimenting with the paint. Prodigies exhibit a feverish "rage to master", working with an intense focus and drive. In addition, Winner says, “I have never seen a child prodigy paint in art abstractly. I’ve only seen them paint realistically or representationally. I have a drawing of Picasso at age 9. It shows that Picasso was struggling to draw realistically, and he was way ahead of his age." So, who is the artist doing the paintings for which people are paying many thousands of dollars? Some people think it's her father, an amateur artist who is present when she paints. Her parents, of course, dispute the accusation. They say that while the father does help Marla by priming her canvases, she does all of the painting. The only help they provide Marla is love and encouragement. The 60 Minutes reporter says that while he has a hard time believing Marla created these paintings, he also believes her parents are good people and wouldn't use their little girl to deceive the world. So which is it? Are Marla's parents horrible monsters using an innocent little girl to commit fraud on the art world? Or, in a "the nail that sticks up is the one that gets beaten down" scenario, is the world so coldly cynical that it cannot accept the explosion of a extraordinary talent in one so young? Either way, the situation is a somewhat sad commentary. I know that the truth will eventually win out, and that I, for one, hope there is indeed a superlative new artist in the making.